Scientific Letter is a scientific mailer. It allows the user to create scientific mail messages with complex equations. 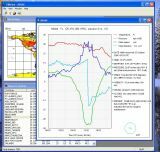 This modern and beautiful scientific software makes the exchange of complex ideas simple. 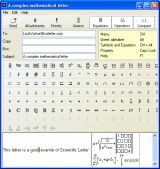 The scientific equation editor used in this software allows you to create complex letters, including complex scientific equations, at almost the same speed as typing standard text. The recipient of a mail message from Scientific Letter who is also using Scientific Letter, will see the message text with equations included in it as graphical parts. The recipient of a mail message from Scientific Letter by someone using another mailer will see the message text with equations included in it in LaTeX notation.